Marriage is a part of human existence that is, although slowly losing its importance and conventionality, is still considered a major stride in romantic human relations. It is common practice and expected behaviour that when two people fall in love with each other, they should consolidate, legitimize and strengthen their union, all of which is believed to occur with marriage. Now, before the marriage can begin properly, one party has to propose to the other and in relationships between men and women, the men often do the proposing. This proposal more often than not occurs with an engagement ring. For some people, the bigger the carats on the rings the bigger your affection for them, in their eyes, there is a correlation between how much you feel for your partner and the ring you deem worthy to propose with. This rationale cannot apply to everyone because we all do not have the same resources to buy rings that quantify the unquantifiable like love, affection, and respect. But for celebrities whose very existences are money-making schemes, quantifying their love with outrageously priced rings is all but typical. Below is a list of female celebrities who have received the top ten most expensive celebrity engagement rings of all time. This list appears in no particular order. 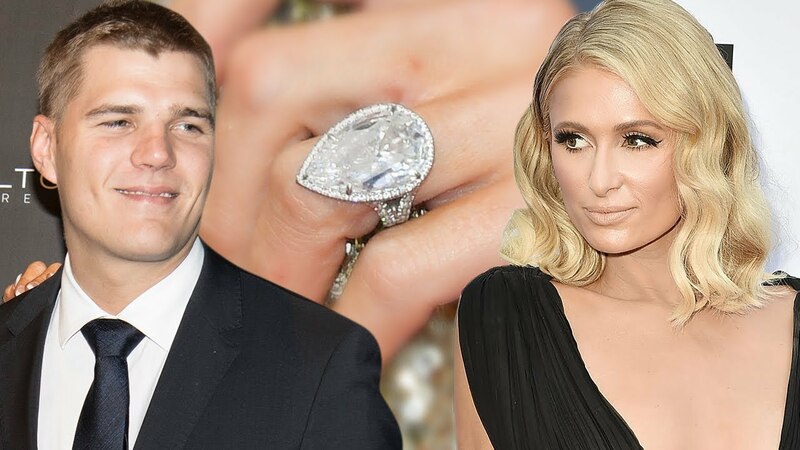 On the 21st of January 2016, in a restaurant in New York City, the American singer-songwriter received an emerald cut, 35 carats, diamond platinum ring from her then fiancé, the Australian billionaire – James Packer. The price of the ring as of 2016 was believed to be $8 million. Though the couple broke up in the seventh month after announcing their engagement, Mariah Carey got to keep the ring. This is not the only high profile ring Mariah Carey has gotten in the name of marriage. Nick Cannon proposed to her with a 10-carat ring and the 10 carats was just for the pink diamond in the centre. It came with small pink and white diamonds that encircled the larger diamond. The small diamonds, as well as the big one, accumulates the total number of carats of the ring to 17 carats. This dims in comparison to the 35 carats one which is more than double the amount of carats, but it is proof that Carey likes her rings expensive, the men in her life are aware of that and try to act accordingly. Next up on our list of most expensive celebrity engagement rings is Elizabeth Taylor. This British Hollywood princess, who was married 8 times (twice to the same man), was enamoured with jewellery, so much that she wrote a book about it titled; My Love Affair with Jewelry; what better way to announce your love for a thing? It is a fact that in her lifetime, she received her share of glorious engagement rings. In 1968, actor; Richard Burton gave her what has popularly been referred to as the Elizabeth Taylor Diamond, this ring was a 33 carat Asscher cut diamond with a VS1 quality, had a D colour and was almost flawless. This ring was with the iconic for the rest of her life, she went with it to almost every occasion. At a 2011 auction of her properties, at the end of her life, the famed ring was sold for $8.8 million. That was almost a decade ago, however, in today’s time and age, it is assumed the ring would cost much more. Despite popular belief, it was however not an engagement ring, but more or less a present from a man who understood his fiancée’s taste. Like Mariah Carey, Elizabeth Taylor also had another ring that was highly valuable and expensive; this ring was an engagement ring from her third husband; Mike Todd. With 29 carats, the ring was an emerald cut diamond which she referred to as ‘my ice skating rink’. After receiving the Krupp ring – the one Richard Burton got her, she stopped wearing her rink and sold it a few years after. Kim Kardashian and her family revolutionized the idea of reality television and can be credited with the pop culture phenomena of reality TV as we know it in the 21st century. She is royalty in this sphere and it is general knowledge that royalty owns the best jewellery. This Kardashian beauty was a victim of a robbery attack in Paris where the first ring she got for her engagement from her husband – Kanye West was taken by the robbers. The first was a 15 carat, D flawless cushion cut 2A diamond ring made by bespoke jeweller Lorraine Schwartz. The ring was valued at about $8 million. Kanye West then replaced the stolen ring with a 20-carat ring created by the same jeweller and had the word ‘Adidas’ engraved on it, in honour of his deal with the company. With this ring, her position on this list surpassed the one she held previously. Her ‘divorce diamond’ – which is what her ring from her 72-day marriage to pro basketballer Kris Humphries is called – was a 16-carat diamond, estimated at $2 million. It was auctioned off at $749,000 in 2013. It is clear that Kim Kardashian loves her jewellery and gets jewellery befitting royalty. Bet you already knew Beyoncé would make it on our list of most expensive celebrity engagement rings. There is obviously a pattern with the women on this list; up next is the one and only Queen B –Beyoncé Knowles Carter. Just like Kim Kardashian, her engagement ring is from the highly acclaimed jeweller Lorraine Schwartz. 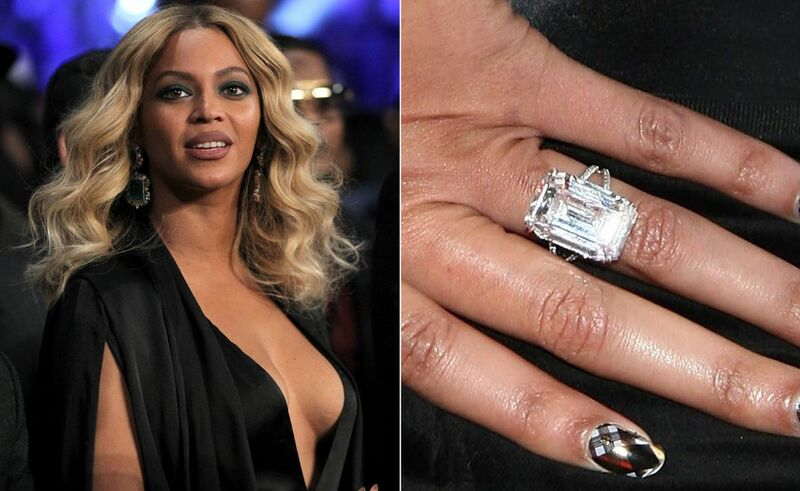 Valued at over $5 million, Beyoncé’s ring has an 18-carat diamond that is flawless and in an emerald cut, it is a ring that speaks to the gloriousness that she exudes. It is safe to say that Jay-Z got this one thing right. This former first lady (royalty again) was the wife of the assassinated John F. Kennedy; after his death in 1968, she married the Greek shipping magnate Aristotle Onassis. His proposal to her was with a 40-carat ring from the jeweller Harry Winston, the ring was a Marquise cut, dubbed the Lesotho III. The diamond was one of the 18 that was hewn from the rough unrefined stone of the Lesotho Brown diamond that was 601 carats. It is thought of as the most expensive engagement rings of all time and rightfully so. 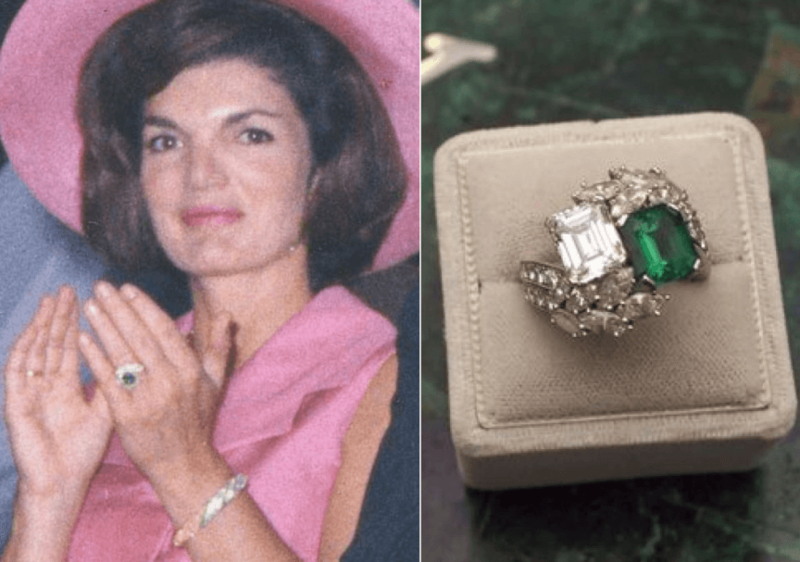 At an auction of Jacqueline’s belongings in 1996, the ring was sold for $2.6 million, it is believed that she almost never wore the ring because of its size. Her first ring from John F. Kennedy was made up of diamonds and an emerald that came to a total of 8 carats. In May 2005, Paris Hilton got engaged to Paris Latsis, who happens to be a Greek heir to a shipping company. The ring that was given to her by Latsis was an emerald cut with 24 carats which was purchased for $4.7 million. The couple split in September of the same year but the American celebutante kept the ring. Hurricane Katrina occurred in August of the same year destroying properties and people’s home, Paris Hilton decided to auction the ring and gave the proceeds of the auctioning –which amounted to $2 million – to victims of the Hurricane. 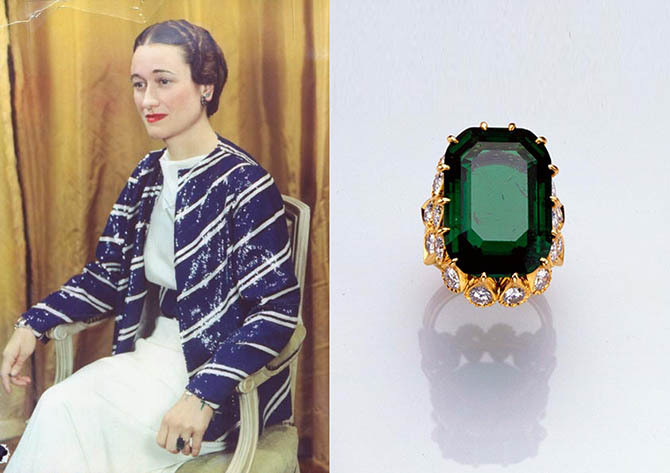 Up next on our list of most expensive celebrity engagement rings is Wallis Simpson’s. Few scandals have tainted the pristine reputation the British royals have tried to create for themselves and one of these scandals was the marriage of Edward to the American socialite Wallis Simpson. Not only did he abdicate his throne for her but he relinquished to her, in honour of their engagement, a 19-carat ring. The ring had an emerald instead of a diamond; it also bore the inscription “We Are Ours Now”. This proof of their ‘forbidden’ love was auctioned for $1.98 million. This singer, songwriter and dancer is another woman who has had her share of high profile engagement rings – firstly, with the 6-carat pink diamond engagement ring that her then-fiancé, Ben Affleck gave to her which she returned by the time they broke up. But her engagement ring from Marc Anthony had a blue diamond and was 8.5 carats which easily topped Affleck’s ring. It is a given fact now – become a member of any royal family and be sure to be bequeathed with a beautiful ring. 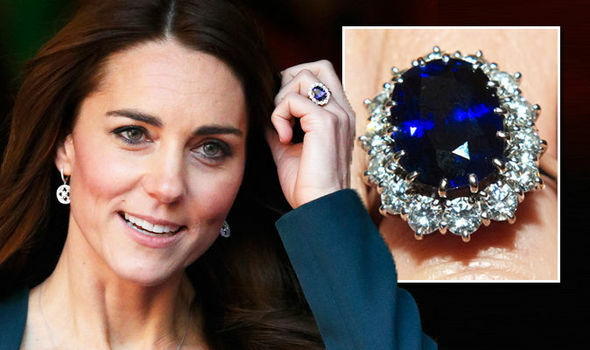 The Duchess of Cambridge, Kate Middleton, currently owns the ring that was once Princess Diana’s, her husband’s late mother. The sapphire ring is a 12-carat ring that has solitaires, 14 in number, surrounding the primary stone. As of 1981 when it was presented to Diana by Prince Charles, the price of the ring was an estimate of $47,000 but that amount has appreciated over time. It comes as no surprise that the first lady of the United States of America makes this list. For his third wife, Donald Trump purchased a ring from Graff; this ring has 12 carats and an emerald cut diamond, which as at the time of its purchase was estimated to be about $2 million. Being married to a billionaire, it went without saying that Melania‘s engagement would make it to our list of most expensive celebrity engagement rings of all time.